However you use your Mac, a little more organization probably wouldn't hurt. Circus Ponies' NoteBook 3.0 gives you astounding powers to manage your digital life—provided you’re not initially terrified by its mind-boggling scope. 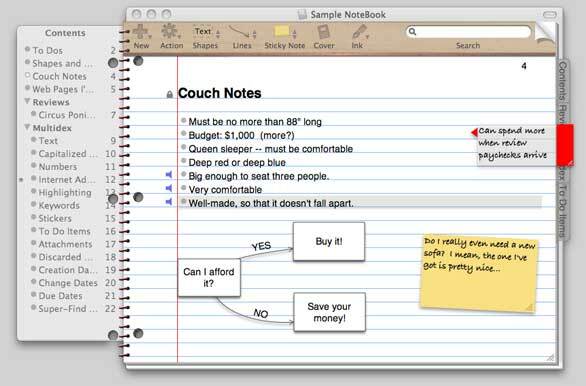 NoteBook, a premiere notetaker and organizing tool, isn't unfriendly by any means. Multiple paper and binding types (including legal pads, three-ring binders, and graph paper) and virtual sticky notes and tabs give the program a welcome touch of whimsy. Still, the sheer extent of its features can seem intimidating at first. NoteBook's Starting Points screen offers 14 different preset templates, from recipe books to trial preparation. Its online manual, though clear and complete, is no less daunting. Thankfully, the Starting Points screen links to a concise PDF that walks new users gently through the basics. NoteBook possesses formidable powers of organization. The default Notes pages let you easily create hierarchical bullet-pointed lists. 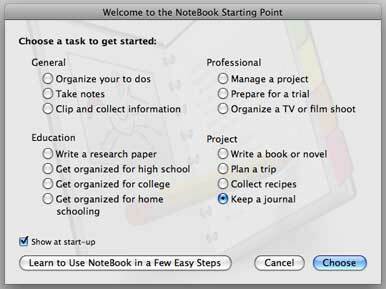 You can also make To Do pages, with checkboxes and due dates for each item, and Writing pages for basic word processing. Dividers with color-coded tabs help you manage all these pages, and each new page or section automatically appears on your notebook's Contents page, ready to be reordered or deleted as needed. For decisions monumental or mundane, Circus Ponies NoteBook offers a variety of tools to help you make up your mind. NoteBook lets you pull in a wide range of files, including text files, PDFs, movies, Web clips, Address Book cards, and photos. Dragging and dropping most items works well, but video clips can be tricky. Sometimes I could drag videos directly to a page; other times, I had to create a new bullet point, and then drop the video into its waiting text field. The developers say NoteBook has trouble handling videos when it’s treating them as independent objects, a bug they’re planning to fix in future versions. For now, you can easily work around the problem by turning off that option in the Preferences menu. If you get tired of dragging and dropping or cutting and pasting, you can move text and photos from other applications into Notebook via its Clipping Service feature. Once enabled, it’ll let you send whatever you’ve highlighted directly to a specific page in a given notebook—or even to a subsection within a page—via the Mac’s contextual menus. Aside from the minor inconvenience of having to individually enable such clippings for each page of your notebook, it’s a clever and convenient feature. I was particularly impressed with NoteBook's voice annotations. Start recording, then speak as you type new bullet points into a Note page. NoteBook will automatically create a separate sound clip of what you were saying as you typed each item. You can easily export these voice notes to iTunes and your iPod. For visual thinkers, NoteBook includes a basic drawing program, with resizable shapes and lines to create flow charts or diagrams. Support for drawing tablets, including pressure-sensitive line thicknesses, lets you add quick freehand sketches or doodles. You can even use Mac OS X's Ink handwriting recognition feature to turn your scrawls into text, though you'll have to hunt around a bit to enable it, and the feature ultimately seems more nifty than practical. Need to keep your notebook’s content secret? You can encrypt and password-protect individual pages or entire notebooks. Want to share your novel, travel journal, or Biology 101 notes with others? NoteBook lets you export bundles of pages or entire notebooks for other NoteBook users, or convert them to text, RTF, Microsoft Word, PDF, and other formats. Better yet, you can transform an entire notebook into a fully functional Web site. My test notebook converted to a Web site in seconds, and included my audio notes as MP3 files. NoteBook’s usefulness can also be bewildering for novice users. Where’s the 'Don’t Make My Brain Explode' button? And when you need to unearth a word, phrase, or photo from the depths of your notebook, the amazing Multidex can help. As you create a notebook, it automatically compiles lists of individual words, Web addresses, highlighted text, and items in nearly a dozen other categories. It’s also fully integrated with Spotlight; search for a term there, and when you open the NoteBook file listed in Spotlight’s results, you’ll see a custom index page of all the times that word appears in your notebook. Though NoteBook has a bare-bones interface on first launch, the View menu lets you augment the basic window with a handy customizable toolbar (which I wish were enabled from the get-go), a floating list of contents, rulers, and a navigation bar. Overall, NoteBook looks beautiful, responds quickly, hews reasonably closely to Mac usability conventions, and performed flawlessly in my tests. It packed in all the useful features I could have imagined, and several I couldn’t have. At $50 for regular users and $30 for students, Circus Ponies NoteBook 3.0 seems fairly priced, given its quality and usefulness. Once you adjust to its overwhelming abundance of options, it's a terrific notetaking program bursting with useful ways to organize your life.